Mulberry is the common name for any of the deciduous trees comprising the genus Morus of the flowering plant family Moraceae, characterized by simple, alternate leaves, a milky sap, and a small, edible, multiple fruit. The term also is used for the sweet-sour, blackberry-like fruit of these trees. Mulberries are native to warm, temperate, and subtropical regions of Asia, Africa, and the Americas, with the majority of the species native to Asia. 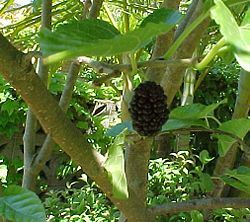 While the Morus genus comprises the "true mulberries," there are also trees in other genera that utilize the name mulberry, including the paper mulberry, Broussonetia papyrifera. Mulberries provide a number of culinary, commercial, and ecological benefits. The edible fruit is eaten fresh or used in jams, jellies, pies, tarts, and wines. The wood of mulberries is used for such purposes as fence posts, barrels, and furniture. And ecologically, various animals, including the domesticated silkworm, Bombyx mori (Latin: "Silkworm of the mulberry tree"), use mulberry as a food source. Bombyx mori feeds only on the mulberry, favoring the leaves of the white mulberry, Morus alba. The Moraceae family is commonly known as the mulberry, or fig, family. This family of flowering plants comprises about 40 genera and over 1000 species of plants widespread in tropical and subtropical regions, and less common in temperate climates. The only synapomorphy (a feature novel to a species and its descendant species that is used to infer common ancestry) within Moraceae is presence of lactifers and milky sap in all parenchymatous tissues. However, generally useful field characters include two carpels, sometimes with one reduced, compound inconspicuous flowers, and compound fruits (Judd et al. 2008). Included are well-known plants such as the fig, banyan, breadfruit, mulberry, and osage-orange. The "flowers" of Moraceae are often pseudanthia (reduced inflorescences). The Moraceae family, the Morus genus, comprises about ten to sixteen species. Mulberries are fast-growing when young, but soon become slow-growing and rarely exceed 10-15 meters tall. The leaves are alternately arranged, simple, often lobed—more often lobed on juvenile shoots than on mature trees—and serrated on the margin. The fruit is a multiple fruit, two to three centimeters long. It resembles blackberries somewhat in size and shape. The fruits begin as white or green to pale yellow with pink edges. They are red when ripening. A fully ripened mulberry is dark purple to black, edible, and sweet with a good flavor in several species. The taxonomy of Morus is complex and disputed. Over 150 species names have been published, but only 10-16 are generally cited as being accepted, though diverse sources cite different selections of accepted names. The classification also is complicated by widespread hybridization, with the hybrids being fertile. The ripe fruit is edible and is widely used in jams, jellies, pies, tarts, wines, and cordials. The three main varieties used are black, red, and white (Herbst 2001). Unripe berries are incredibly sour, but when fully ripe the flavor has been described as sweet-sour, albeit somewhat bland (Herbst 2001). The fruit of the black mulberry, native to southwest Asia, and the red mulberry, native to eastern North America, have the strongest flavor. The fruit of the white mulberry, an east Asian species which is extensively naturalized in urban regions of eastern North America, has a different flavor, sometimes characterized as insipid. Black, red, and white mulberry are widespread in Northern India, Azerbaijan, Armenia, Pakistan, Iran, and Afghanistan, where the tree and the fruit are known by the Persian-derived names Toot (mulberry) or Shahtoot (King's or "Superior" mulberry). Jams and sherbets are often made from the fruit in this region. Black mulberry was imported to Britain in the seventeenth century in the hope that it would be useful in the cultivation of silkworms. It was much used in folk medicine, especially in the treatment of ringworm. The mature fruit contains significant amounts of resveratrol. Unripe fruit and green parts of the plant have a white sap that is intoxicating and mildly hallucinogenic. The wood of mulberries is also used for such purposes as fence posts, barrels, and furniture. Mulberry leaves, particularly those of the white mulberry, are ecologically important as the sole food source of the domesticated silkworm, Bombyx mori (Latin: "silkworm of the mulberry tree"), the pupa/cocoon of which is used to make silk. The caterpillars feed on leaves of mulberry trees, with the preferred food being the white mulberry. Adults in the Bombycidae family have reduced mouth parts and do not feed. Other Lepidoptera larvae also sometimes feed on the plant, including common emerald, lime hawk-moth, and the sycamore. Mulberries can be grown from seed, and this is often advised as seedling-grown trees are generally of better shape and health. But they are most often planted from large cuttings, which take root readily. Anthocyanins are edible, water-soluble vacuolar pigments that belong to a class of molecules called flavonoids and that may appear red, purple, orange, blue or black, according to pH. Anthocyanins hold potential use for health benefits (Gross 2007) and as natural food colorants. As the safety of synthetic pigments is doubted and in the wake of increasing demand for natural food colorants, their significance in the food industry is increasing. In addition to yielding attractive colors, they are water-soluble and thus are easily incorporated into aqueous food systems. Anthocyanins also possess an antioxidant property and are being investigated for antineoplastic, radiation-protective, vasotonic, vasoprotective, anti-inflammatory, chemopreventive, and hepato-protective properties. Research on 31 cultivars of mulberry yielded a total anthocyanin level, calculated as cyanidin 3-glucoside, ranging from 147.68 to 2725.46 mg/L juice (Liu et al. 2004). The researchers also reported a potentially cheap and effective industrial method for extracting and purifying the anthocyanins using macroporous resins. Total sugars, total acids, and vitamins remained intact in the residual juice after removal of anthocyanins and the residual juice could be fermented in order to produce products such as juice, wine, and sauce. The genera Morus has been domesticated over thousands of years and constantly been subjected to heterosis breeding (mainly for improving leaf yield). By such means, it is possible to develop cultivars suitable for berry production, thus offering possible industrial use of mulberry as a source of anthocyanins for functional foods or food colorants that could enhance the overall profitability of sericulture. EROWID. 2008. References and mentions of the hallucinogenic properties of mulberry. Retrieved May 8, 2008. Gross, P. M. 2007. Scientists zero in on health benefits of berry pigments. Natural Products Information Center. Retrieved May 8, 2008. Judd, W. S., C. S. Campbell, E. A. Kellogg, P. F. Stevens, and M. J. Donoghue. 2008. Plant Systematics: A Phylogenetic Approach. Sunderland, MA: Sinauer Associates. ISBN 9780878934072. Liu, X., G. Xiao, W. Chen, Y. Xu, and J. Wu 2004. Quantification and purification of Mulberry anthocyanins with macroporous resins. J Biomed Biotechnol. 2004(5): 326–331. Retrieved May 8, 2008. Weiguo, Zhao, Pan Yile, Zhang Zhifang Jia Shihai, Miao Xuexia, and Huang Yongping. 2005. Phylogeny of the genus Morus. African Journal of Biotechnology 4(6): 563-569. Retrieved May 8, 2008. Flora of North America: Morus. University of Melbourne: Sorting Morus names. Information on mulberry, silkworms and sericulture. This page was last modified on 23 October 2018, at 23:31.